RC cars are one of the best gifts you can get for your kids. The problem is, a toddler needs a different RC car than a 10 year old. So how do you know which RC car to get your kid? 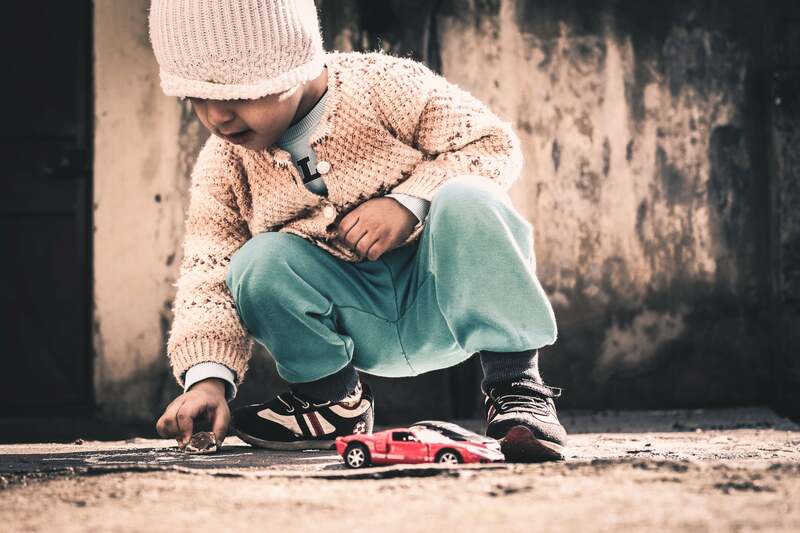 When looking for a remote control car for a child, there are a few qualities you should look for. First of all, you want something that is age appropriate. A toddler may get hurt using a fast RC that is meant for a 10 year old, and an 8 year old will be super bored by a slow car. That is why you need to make sure the features match up with the age. Second, you should make sure that the RC car is affordable. Let’s face it, kids break stuff. I know I broke my fair share of toys as a kid. Even if your kid isn’t super wild, you should still plan on having to replace the RC after a few years, because they will outgrow it. For this reason you should get something less expensive, so you don’t have to break the bank every time you buy a toy for your kid. We put together this list of the best RC cars for kids in each age range so you won’t have to do the research like we did. We start with Remote control cars for toddlers, and then work our way up to age 10. After 10 years old, you should look into purchasing a hobby grade RC car, as opposed to a toy grade one. The best remote control car for toddlers is the Liberty Imports Cartoon RC Car. 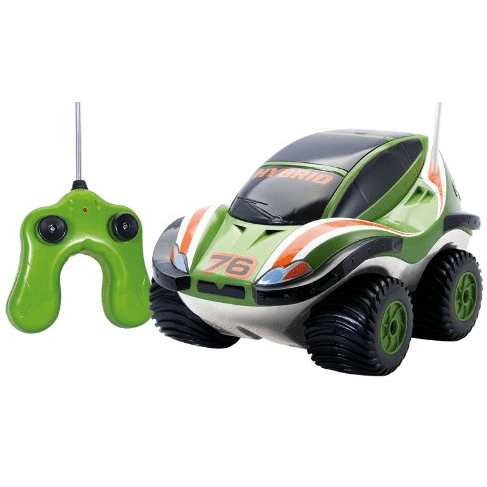 This RC toy car is great for even the youngest of children, as it is safe, inexpensive, and easy to use. The Cartoon Race Car has three pieces to it. There is the car, the steering wheel/remote, and a removable driver. The steering wheel is extremely basic and only has two buttons, one for forward, and one for reverse that also turns it. The car its self is very entertaining to toddlers, as it has horn noises, light-up headlights, and even some music. The best part about this toy is that it doesn’t even have to be used as an RC, the kid can just play with the car. 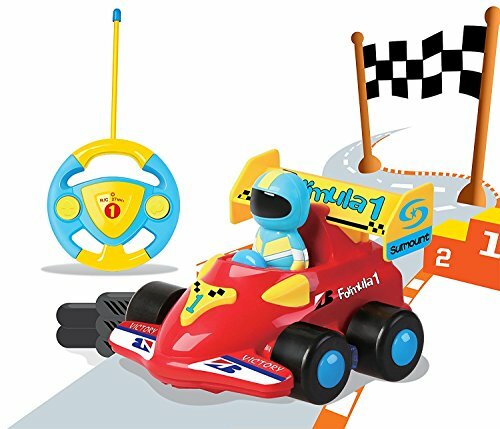 The Cartoon Race Car by Liberty Imports is the best choice RC car for toddlers, as it has the perfect combination of affordability, simplicity, and entertainment. Another great thing about it is it can be had at the lowest price of any car in this list. 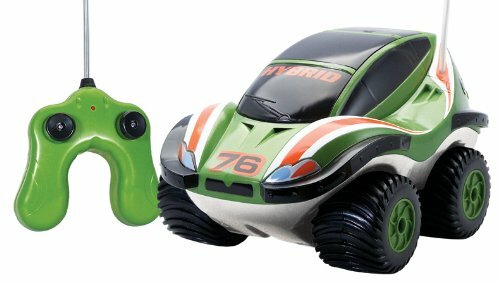 The best remote control car for 4 year olds is the Fisher-Price Transforming RC Blaze. The Blaze is great for kids this age because it has a few features that are enough to entertain, but also still very safe. 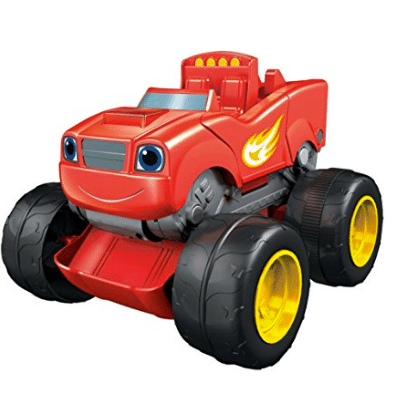 The RC Blaze is a product that is made by Fisher-Price in conjunction with Nickelodeon. These two designed a great toy that is very fun for kids to play with. 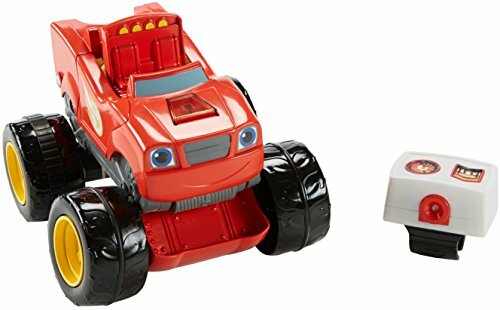 This is a two in one toy, as it takes on the shape of a truck and race car. This toy has many features that will keep your child entertained for hours. For starters, it has the ability to transform between a car and a truck at the touch of a button. As well, the remote can be worn on the wrist like a watch, or handheld. It also makes cool noises and sound effects, as well has lighting. If you need a toy that has just enough features to keep your child entertained, but not so many that it is complicated or dangerous, this is the perfect RC car for you. Also, the competitive price makes it even more appealing. The best RC car for a 5 year old is the Kid Galaxy Amphibious RC Car. The sweet price of this car and its amphibious features make it great for kids in this age range. a boat. This can be a great way to entertain your child outside. Although, they don’t even need to be outside to enjoy it, as you can fill up the bath tub with water and let them use it there. Beyond its ability to go in water, this thing is built tough and uses 4×4, so it can go through pretty much any terrain. It has easy controls, so don’t worry about it being too complicated to be used by a child. Keeping a 5 year kid entertained can be pretty tough, but this RC car will surely get the job done. On top of this, the car is the lowest priced vehicle that we have seen with these features. 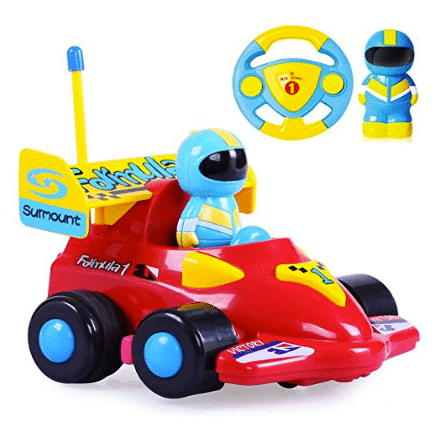 Full Function: Age 5+; Dimensions: 11 x 7 x 6 inches; Batteries required: 2 AAA and 3 AA (not included); 27 MHz, Note: To operate multiple Morphibians vehicles at the same time, each vehicle must operate on a different frequency. 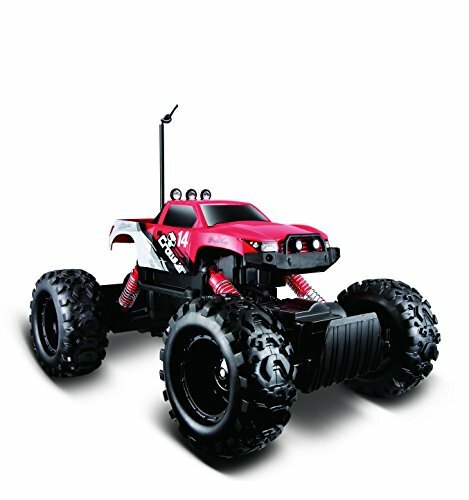 To find a compatible RC, search for "Kid Galaxy Morphibians 49 MHz"
The best RC car for 6 year olds is the Maisto RC Rock Crawler. This RC is a great way to get your kid to enjoy the outdoors. The all-terrain ability means they can take it anywhere and still be able to use it. 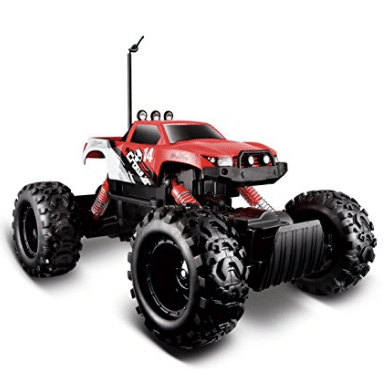 The Maisto RC car is what is known as a “crawler”, which is a type of RC that is made for climbing over obstacles like rocks and rough terrain. They have the ability to operate almost anywhere and not get stuck, which is a great choice for outdoor use. Even though this RC is made for children, it still has features that you see in hobby grade crawlers. For example, this truck comes with low gearing and two motors, making it great for off-roading. Another nice thing is that it is run off of double A and Triple A batteries, so you don’t have to buy a charger, you can just pop in the batteries and go! If you are searching for a toy that will keep your child out of the house, the Maisto RC Car is the perfect choice for you. But don’t take our word for it, check out the crazy good reviews on Amazon. 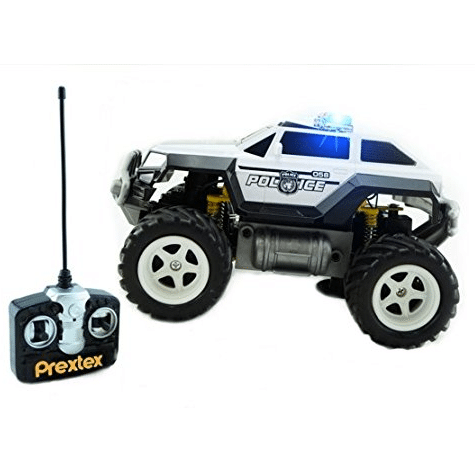 The best RC car for 8 year olds is the Pretex RC Monster Police Truck. What child doesn’t like to pretend? 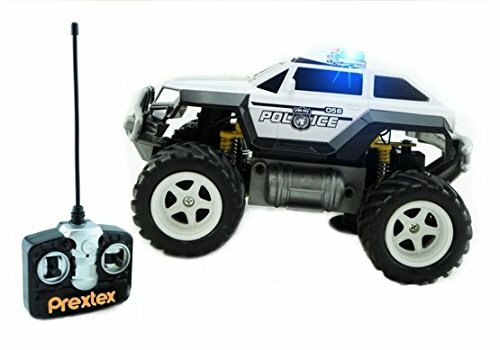 Have your kid be a force of good with this fun RC police car. When a child gets to this age, they begin to care less about novelty features, and care more about one thing: SPEED. This car is blazing fast, moving at speeds of 10 MPH and faster! Moving this fast is extremely fun, and is one of the best things about this toy. Your kid can really act like a police officer with this truck, as it has working police lights, and realistic function. The car also has a range of up to 30 feet, which means you can really put that speed to the test and catch those bad guys! Whether your child likes to pretend to be the police, or they just like going fast, the Pretex RC Monster Police Truck is a smart choice. But another reason you should buy this is the less than $20 price tag. Talk about bang for your buck! 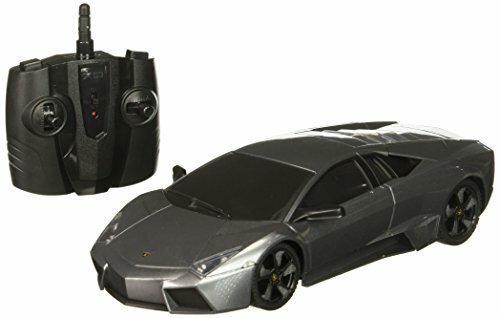 The best RC car for 10 year olds is the RC Lamborghini Reventon 1/8 Scale. At this age, kids start to care less about the features of the car, and care more about having something cool to show off to their friends. This RC is definitely “cool”, as it is modeled after one of the coolest cars ever. The car is made to be as realistic as possible. 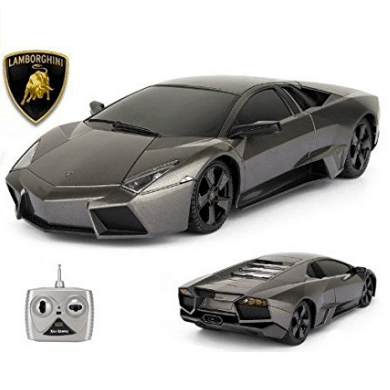 It is a 1 to 8 scale of the original Lamborghini Reventon. It is “ultra-detailed” with rims and a gloss paint job. If the original Lamborghini has amazing specs, then why shouldn’t the model? The RC Lamborghini is almost as fast as the original, topping out around 8 MPH. It also handles like a dream, with amazing cornering ability. If your child wants to be rich, give them a taste of the good life with this model Lamborghini. Not only does it outperform other similar RCs, but it looks cool while doing it. But what is even cooler is you can buy your kid a Lambo for less than $30. It is important to note that not all kids of the same age are at the same maturity level. Even though your child may be 6 years old, they may behave more like a 4 or 10 year old. Be sure to consider this and adjust accordingly. Obviously you know your kid better than we do. If your child is too mature for these, or they are older, you may want to consider purchasing a hobby grade RC car for them. Although hobby cars are more expensive, they are faster, handle better, and are more fun to play use. For recommendations on a good hobby grade remote control car, be sure to check out our other reviews.